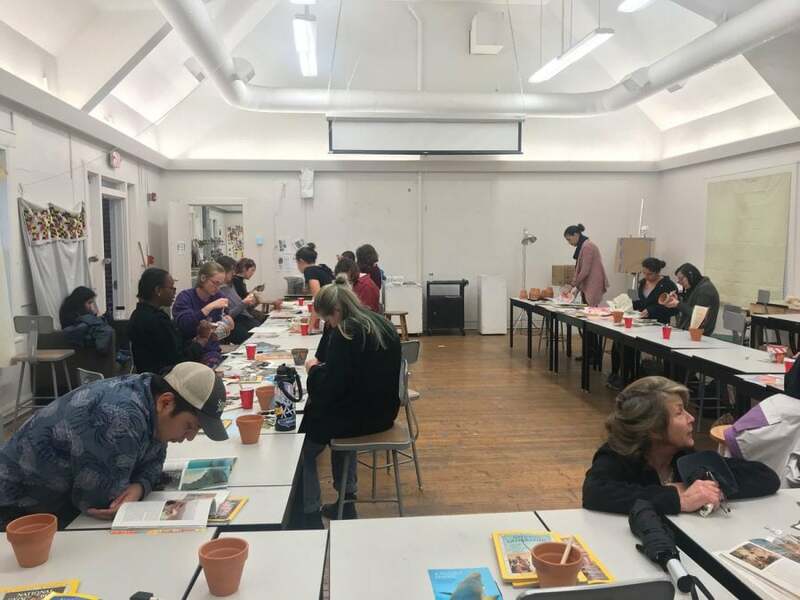 On Friday, April 5, from 6:00 to 8:00 p.m., Guilford students, staff and faculty, as well as members of the Greensboro community, gathered in room 202 of Hege-Cox Hall to eat ice cream, collage plant holders and take home seedlings of what will grow into things like basil or rosemary. Organized by members of Guilford’s Food Justice Club, including sophomore Sophie Pesakoff, juniors Jackie Sullivan, Addie Ronis and Mallory Cerkleski and senior Daniel Bowen, the event served as a prelude to Saturday’s FoodStorm 2019 Conference. Those who attended not only got to enjoy the company of others while eating ice cream, but were given the opportunity to learn how to plant seeds into the pots they collaged. The event’s activities all tied in the weekend’s theme of food justice. The event not only brought out members of the Food Justice Club, but many students from the wider Guilford community who value finding solutions to food insecurity, including junior Elanna Reber. Others who are indirectly involved in the Food Justice Club expressed enthusiasm for the event. Junior Clare Chalkley commented on the student organization as a whole. Those who were directly responsible for putting the evening together, like Sullivan, knew exactly what they were hoping attendees would take away from the event. Other event organizers, including Ronis, were passionate about the ideas behind the Food Justice Club and FoodStorm as a whole. Ronis, on the other hand, was mostly looking forward to what the afternoon would bring. However, according to senior Elias Smolcic-Larson, the FoodStorm Conference will not be limited solely to Guilford community members. Friday’s collaging social was full of those, like Smolcic-Larson and many others, who are passionate about food justice, making for what seemed to be a very exciting evening in anticipation of FoodStorm 2019.